Column: What were the weirdest local news stories of 2016? In an annual ritual, but a delightful one I hope, I rounded up all the books I read this year (minus one that’s out on loan and one that’s a play in a giant Shakespeare omnibus), put them in the middle of my floor and took their photo. My total of 40 for 2016 is precisely half of 2012, the year I read 80 books and my best year to date. But that year I had a lot of short books to read, and also unlike this year, I wasn’t spending an hour or two per week working on my own book. I realized, too, that I took far fewer Metrolink trips this year, an act that gave me enforced reading time. Still, there’s nothing wrong with 40 books. Wednesday’s column tries to make sense of the year. Below is a list of every book in chronological order. “The Autobiography of Mark Twain,” Charles Neider, ed. Of course I didn’t get to everything I’d have liked, not by a long shot, but many of these I’d been wanting to read for a long time. How was your year in reading? December’s reading consisted of a 1997 mainstream novel, a 1966 science fiction novella and a 1921 collection of comic essays. Fans of “High Fidelity” will especially love “The Wishbones,” another look at a rock fan, in this case an early-30s guitarist in a wedding band who’s having trouble accepting adult responsibilities. Does he really want to marry his high school sweetheart, whom he’s been dating for 15 years off and on, and live in the suburbs? I liked it, and it’s funny, but it lacked some of Nick Hornby’s verve and depth and I suspect will prove easier to forget. “Mankind Under the Leash” was the original, and better, title of Disch’s “The Puppies of Terra,” in which benevolent invaders have domesticated humans as pets, except for the dingoes who remain wild. Told in the first person by a human pet named White Fang with a mock-David Copperfield tone, this is cute at times, but exceedingly slight. In short, kind of a dog. “Of All Things!,” Benchley’s first collection, has its moments, starting with the dedication to the inventor of the Bessemer steel converter and continuing through the preface, which merely reproduces the Declaration of Independence, but most of what follows is lesser Benchley, light but rarely outright funny. He hadn’t hit his stride and there’s no use pretending. He did, however, make a crack about the world being divided into two types of people, and I had to wonder if that was already a thing or if he might have invented a line still used today. I had these books largely wrapped up by mid-month and could have squeezed in another one or two, but instead tackled an overdue project, which was to take a close look at a few books that didn’t seem worth reading cover to cover. Each got an hour or two of my time. 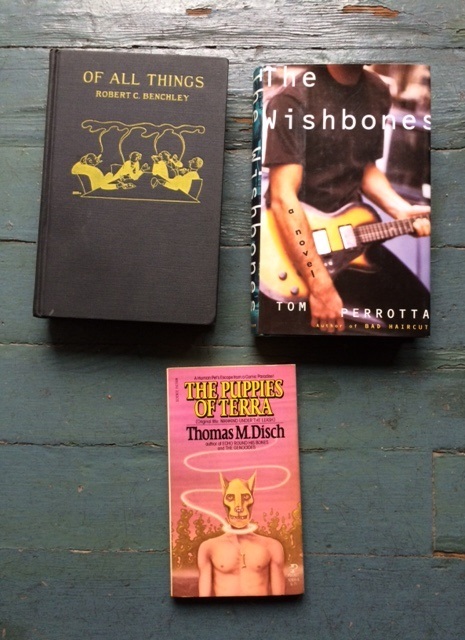 Among them were Pete Townsend’s memoir, “Who I Am”; a fannish Beach Boys essay collection, “Back to the Beach”; and a biography of the band The Replacements, “Trouble Boys.” I like all three acts, but not enough to read 300 to 400 pages about them. One book, “American Silent Film,” looked like it might be of enough interest to read in full, so I put it back. In all, I disposed of 10 books in 11 days. From there, I started a book that I had wanted to read this fall and now hope to finish in January. 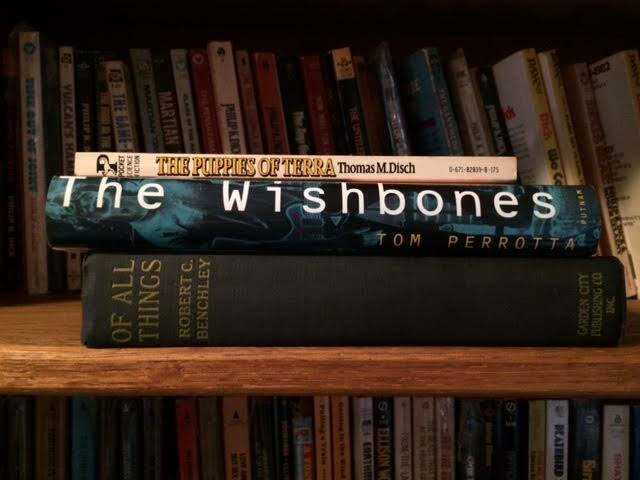 As for where these books came from, “Wishbones” was gifted from a friend who was moving away around 1999, “Puppies” was bought at Patten’s Books in St. Louis in June and “Things!” must have been bought in the ’00s, but I don’t remember the circumstances. How was your December, readers? If you’re still reading, feel free to come back Jan. 1. 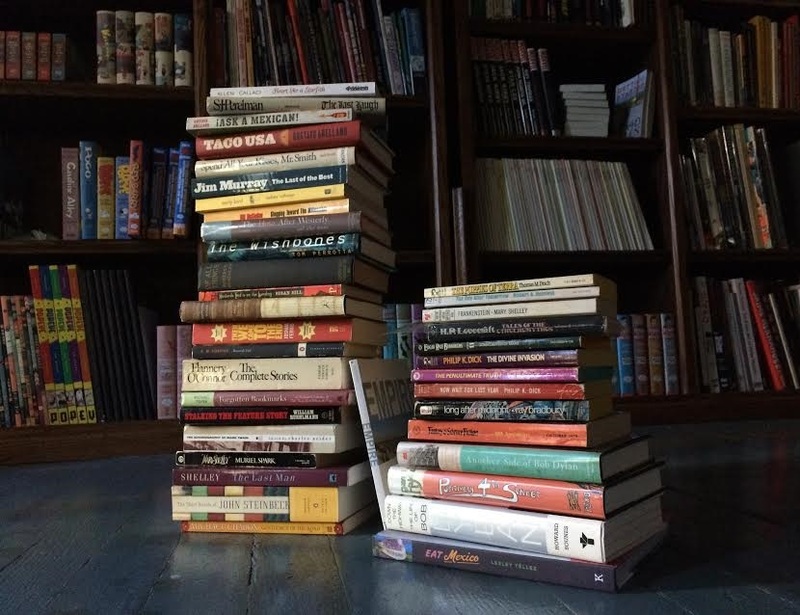 I thought I’d get this post out of the way so I can move on to my annual column and blog post on what I read for the year. Next month: a book I had wanted to read this fall and, I hope, one I’ve meant to read for seven years. Upland’s Second Avenue becomes Candy Cane Lane at Christmastime, and more candy canes are out than in many years thanks to an effort by two families new to the neighborhood who wanted to revive the tradition. Sunday’s column tells the story. Merry Christmas! Friday’s column reports on this week’s Ontario City Council meeting, namely, the move to give Mayor Paul Leon a big boost in pay, seven years after giving him a big cut in pay. I explain what it’s all about. 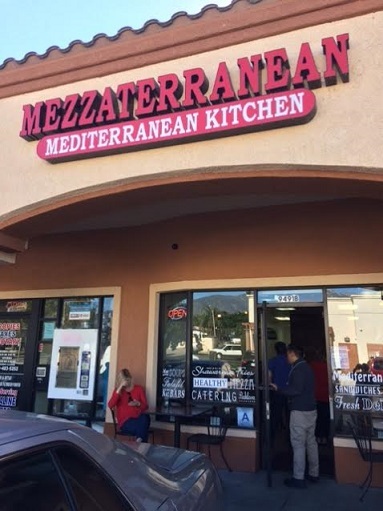 I learned about Mezzaterranean, the name being a clever mashup of Mediterranean and mezza, the Lebanese name for appetizers, from a friend’s Yelp reviews, and eventually got around to going once I figured out where it was, the Auto Zone center, which many of us would tend to think of as the Taco Hut center. Opened in 2014, it’s a small place, and packed during the lunch hour; on my first visit, at noon, a friend and I had to sit at the makeshift counter as all 25 or so seats were taken. On a second visit, around 2 p.m. (on a different day, just to be clear), I got the only indoor table that was free, although it did clear out over the next hour. It’s a popular place, with many getting take-out besides the dine-in orders. 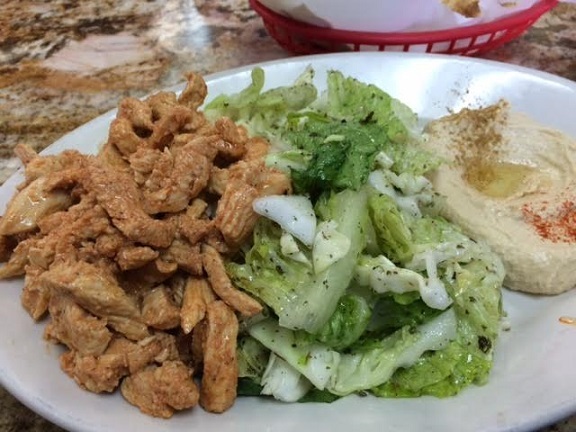 You order at the counter, from a menu with hot and cold mezza, soups and salads, sandwiches and plates. The open kitchen is right behind, a hive of activity. 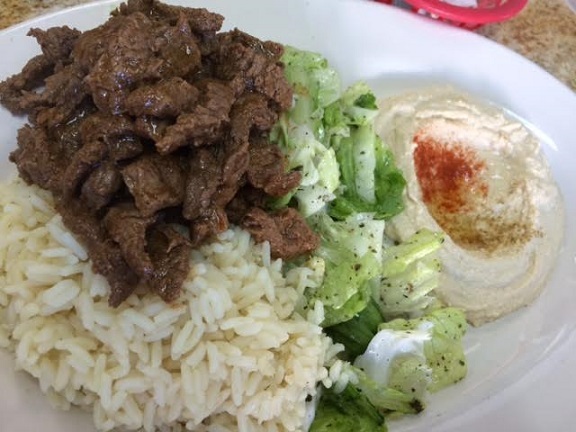 That first visit, I had a lamb kebab plate ($12) and my friend ordered a beef shawarma sandwich ($7). 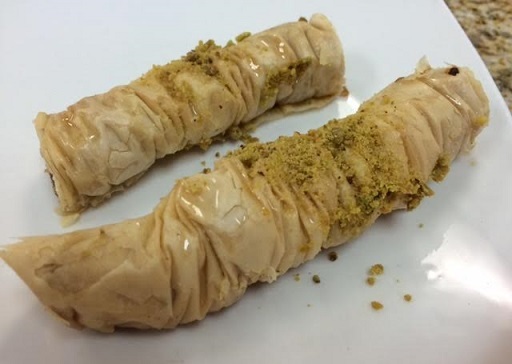 The place was crazy busy and our orders seemed to get misplaced; eventually someone noticed we hadn’t gotten our food, asked what we’d ordered and made it, upgrading my friend to a plate and giving us free baklava ($1), which was very good. And so was the food. 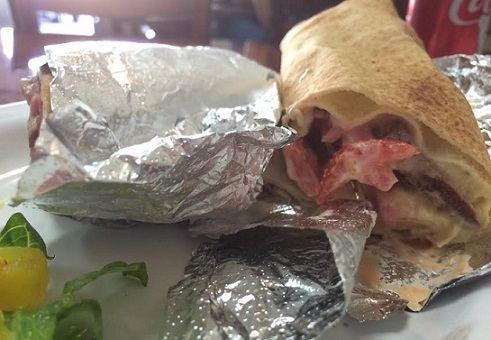 I went back a few weeks later and ordered the soujuk sandwich ($7, below), a spicy beef sausage on a pita with pickles, tomatoes, hummus and sauce. I’d never tried that, and it was okay, but I should have gotten fries or rice or something on the side. 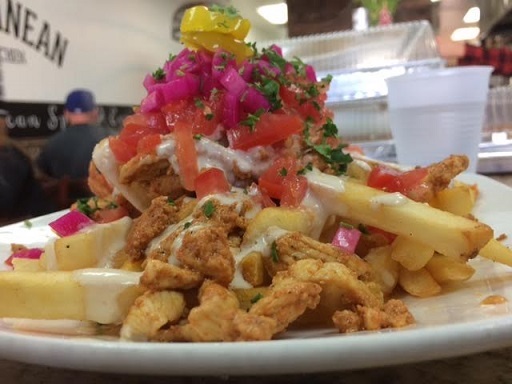 On a third visit, I tried the chicken shawarma fries ($8-ish), at a friend’s recommendation, and those were really good too. 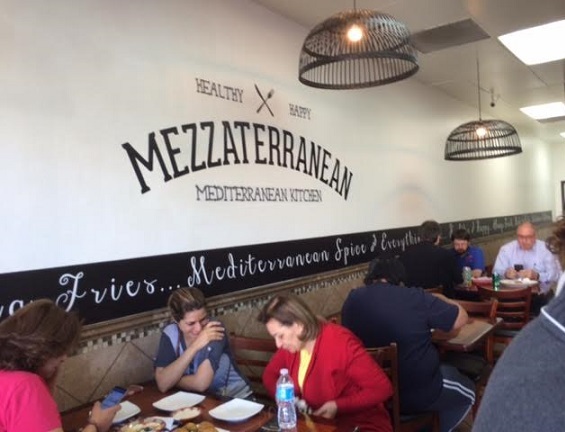 I like Mezzaterranean, although I might give the edge to Zait Bistro, elsewhere in town, for Rancho Mediterranean — which wouldn’t be a bad name for a city. 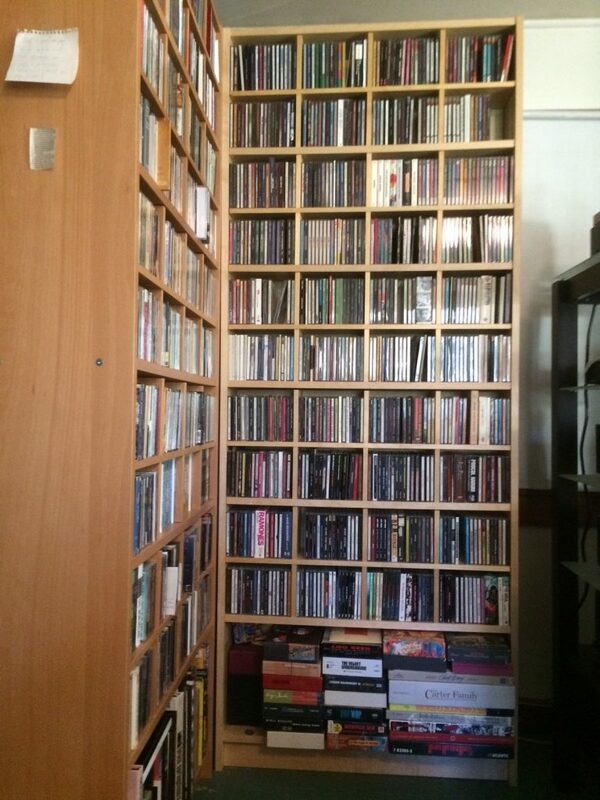 A few weeks ago I completed a personal project: to play all my compact discs again. It took 10 years. I write about that in Wednesday’s column. Above: half of my collection; another two bookcases stand on the other side of my stereo. You might wonder after reading this column — you will read it, won’t you? — what happens next. For starters, all the CDs I’ve pulled have been saved atop my bookcases until my project was done. Now I can trade or sell them. Also, playing my CDs again will be something of a lifelong project, I think, in that I will continually have to pull more to trade/sell if I’m going to keep buying new ones, shelf space being finite. But I’m unlikely to start listening to them again from the beginning. I didn’t have room to get into this either, but there’s the matter of whether some of these CDs that I’m keeping will ever be played again, and if not, was keeping them a futile act? That’s a tough one. What I can say is that since 2006, every CD I own has been played once. Can you say the same about yours? People who grew up here into the 1960s can recall or maybe took part in the wintertime ritual known as smudging. 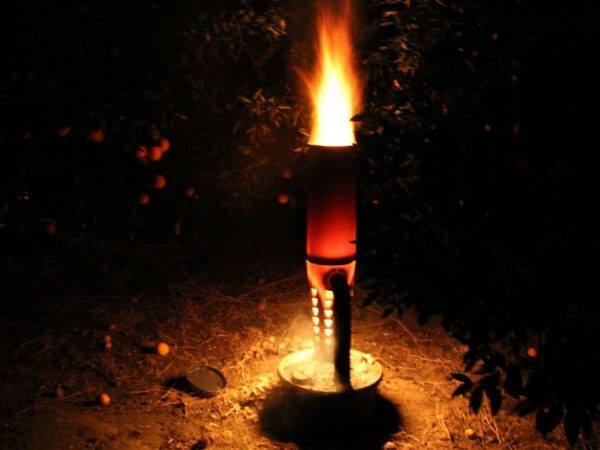 If temperatures dropped to freezing, a citrus crop might be ruined, and thus orchard heaters were put out in the groves and lighted to generate artificial heat. In a sense, they were the forerunners of the heaters used on restaurant patios, except these burned oil and created a blanket of haze. It was a process that might last all night, as heaters were set out, lighted, checked, refilled or relighted. On the Rancho Cucamonga History page on Facebook, Jane Vath O’Connell recently penned a reminiscence of those days, which she invited me to share. I remember the frosty nights in Alta Loma when my family would sit around the radio and listen to the ‘frost reports’. In every rancher’s kitchen it would be the same sight. If they predicted a freeze, my brothers would call their Alta Loma High School friends. Time to go to bed. Mom & I would stay up to check the grove thermometers. When it got to 29* we would wake my dad and brothers. My brothers would call their friends and there would be a commotion in the house while they assembled and I would drift off to sleep with the sound of the wind machines used to keep the air flowing through the groves. Throughout the night, I would hear the guys as they came back to the house to get food or hot drinks to get them through the night. The next morning, when I got up for school, there would be a thick, black haze in the air and my brothers would be allowed to sleep in. Half the boys in Alta Loma High School would be absent and that’s just the way it was in this farming community. Dad was making breakfast for me, not having slept at all. He had to go to work but would first stop by Growers Service on Baseline and Hellman to order more smudge oil. I would go with dad sometimes and always enjoyed jumping off the loading dock amid the smell of smudge oil. I’ve heard many stories of how those long, cold nights turned many boys into men. As did many ranchers, my father had a ‘day job’. He would come home after work that day and try to catch some sleep as the whole process started again. Thanks, Jane. One aspect of her story that I hadn’t understood before, but which makes perfect sense, was that for many, farming was a sideline, probably because citrus isn’t a year-round crop. You might tend your grove, even all night when it was freezing, and then go to your real job. Does anyone have memories to share of that era? Torley’s was a classic Ontario grocery, located at 416 E. A St., later known as Holt Avenue. 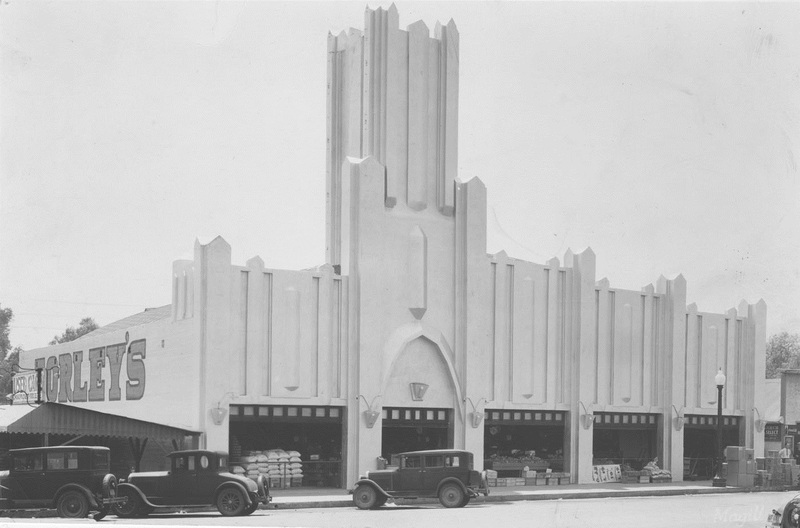 According to the city of Ontario’s Facebook page, which has been posting historical photos for the city’s 125th anniversary, Torley’s Big Store opened in 1930. Torley’s is often spoken of by longtime residents, along with King Cole and Boney’s, two other locally owned markets. Alas, Torley’s closed its doors for good in 1976 and the building is long gone. Do you remember Torley’s? What was it like? What did it sell? Sunday’s column starts with news from Rancho Cucamonga, from the departure of its top librarian for Pasadena to development items and more. Then come five Culture Corner items, one of which involves an Ontario concert with which I’m participating, plus a Valley Vignette. As a behind-the-scenes tidbit, some of these RC items, just as with some of the Chino Hills items Friday, were written weeks or even months ago. This is a year-end move to take some material that has been bumped from previous columns, or saved for future use, and clear it out.